Italy's Amalfi Coast has long been a popular and romantic destination. Its dramatic coastline, clear sea, and moderate climate have attracted visitors since Roman times. From the Amalfi Coast, there are several easy day trips to top sights. If you plan to spend most of your time exploring the Amalfi Coast towns and the island of Capri, the towns of Positano or Amalfi make a good base. From Positano, you can visit other towns by bus or ferries that leave from its port for the islands and the town of Sorrento or take a guided day trip. 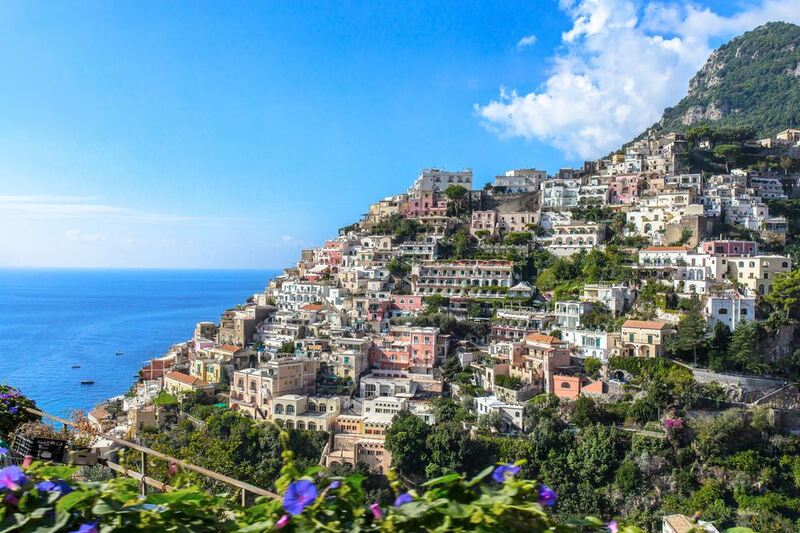 Built on the face of a cliff, Positano is one of the most picturesque and luxurious towns on the coast. Amalfi is a charming and historical resort town, also built on the slopes of the cliffs. Since Amalfi Coast roads are narrow and windy, traveling by bus or car can be slow so if you want to take more day trips, consider staying in Sorrento on the other side of the Peninsula. Sorrento is a charming town that's well connected by public transportation. It's larger and offers a wider range of hotel options. Ferries run between Sorrento and Amalfi or Positano, a nice day trip that lets you visit both parts of the peninsula as well as view it from the sea. Select Italy offers several options for Amalfi Coast Guided Day Tours including grottoes and islands by boat, road trips, cooking classes, or visits to archeological sites or wineries. Visiting the enchanting island of Capri is a highlight of an Amalfi Coast holiday. A favorite with Roman emperors, the rich and famous, artists, and writers, it's still one of the Mediterranean's must-see places. Visitors arrive at Marina Grande where there is a funicular to take you up the hill to Capri, the island's main town. You can also catch a boat from Marina Grande to visit the famous Blue Grotto. To get to Anacapri, the highest town on the island, you will need to take a bus or taxi. Villa San Michele, in Anacapri, has beautiful ​gardens with spectacular views. Nice beaches can be found all around the island. Travel by boat from Positano and enjoy a cruise around the island of Capri with this full-day Capri guided boat excursion, through Select Italy, or if you're staying in Sorrento take the ​Capri Small Group Tour that departs from the port of Sorrento. The island of Capri can easily be reached by frequent ferries and hydrofoils from Sorrento and less frequent ferries and hydrofoils from Positano and Amalfi. Note that in winter, fewer ferries are scheduled and ferries are usually canceled in bad weather. Schedules on websites are not always up to date, so check at the port. The excavations of the Roman city of Pompeii, buried by the eruption of Mount Vesuvius in 79 AD, is one of Italy's most popular ancient Roman sites. The archeological site is huge and there's a lot to see so plan to spend at least half a day there. There's a snack bar inside the archeological area and several restaurant choices in the modern town of Pompei where the excavations are located. From Sorrento, you can easily get to the excavations on the Circumvesuviana train line. Frequent trains go to Pompei Scavi (excavations), taking about half an hour. Check the schedule on the Circumvesuviana website. If you have time for another site, you can take the train to Ercalano Scavi (Herculaneum), a smaller site, about 17 minutes farther down the rail line, or take the bus to Mount Vesuvius if you are finished with Pompeii quickly. From Positano or Amalfi, the trip is longer as you will first have to take a bus to either Sorrento (and follow above directions) or Salerno and then take the regular train to Pompei Scavi, about a 45-minute train trip. Naples Historic Center including Santa Chiara Monastery, street of nativity workshops, underground Naples, and the cathedral. Castel Nuovo, erected in 1279-1282, houses the Civic Museum (closed Sundays) with 14th-15th-century frescoes and paintings, silver, and bronzes. From Sorrento you can easily get to Naples on the Circumvesuviana train line, taking a little over an hour. You can take the train all the way to Napoli Porta Nolana, in a nicer part of town than the main train station. Check the schedule on the Circumvesuviana web site. You can also take a ferry from Sorrento to Naples if you prefer to travel by boat (see Alilauro website for ferry schedules). From Porta Nolana station, you can walk or take a taxi to the historic center. Mount Vesuvius, the volcano that hovers above the Bay of Naples, is part of the National Park of Vesuvius and is open to visitors. From the parking area and ticket office, the walk to the summit of the crater is about 20 to 30 minutes uphill on a rocky trail. On the way up there's a good view of Naples. Mount Vesuvius Visitor Information gives you an illustrated look at visiting the volcano. From Sorrento, take the Circumvesuviana train to the Pompeii-Villa dei Misteri stop. From the station in Pompeii, there is bus service by Busvia del Vesuvio. Check the train schedule on the Circumvesuviana website. Some hotels in Sorrento and on the Amalfi Coast offer excursions to Mount Vesuvius, probably the most convenient way to get there. The island of Ischia is known for its thermal pools with healing waters and its health spas. Water from the natural hot springs, heated by volcanic action, is believed to be the most radioactive in Europe and is good for a variety of health treatments including rheumatism. Ischia is farther than Capri but is visited by fewer tourists so it can make a nice getaway if you don't mind the longer boat ride. You can take a ferry to Capri, then transfer to an Ischia ferry. From Sorrento, Positano or Amalfi there are one or two morning ferries daily that continue on to Ischia after a stop at Capri and return in the afternoon. ​Schedules on websites are not always up to date, so check at the port.